U.S. Treasury Secretary Steven Mnuchin. 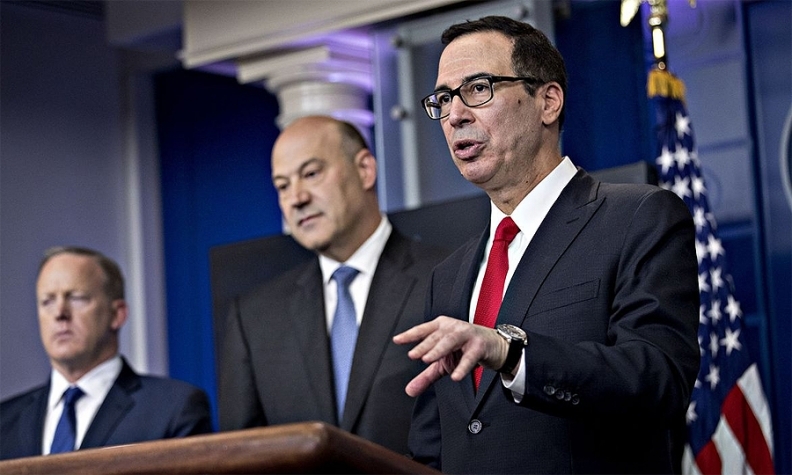 U.S. Treasury Secretary Steven Mnuchin says efforts to renegotiate the North American Free Trade Agreement with Canada and Mexico could spill into next year. Negotiators for Canada, Mexico and the U.S. are under the gun to make headway on a new NAFTA deal after passing the unofficial deadline of May 17, put in place to give Congress enough time to vote on it by the end of the year. Mnuchin said on Fox News Sunday that the negotiators are "still far apart" but continue to work through many issues. Canadian officials say a deal is "close" but issues such as auto-sector content rules and a U.S.-proposed five-year sunset clause remain sticking points. Mnuchin says President Donald Trump is more determined to get a deal he believes is good for the U.S. than he is worried about meeting a specific deadline. Trump has long said NAFTA was bad for the United States and its workers. The United States wants to stem the loss of manufacturing jobs to Mexico, and Canada broadly shares that goal. However, the issue has prompted some concern, and not only from Mexico. While the United States has significantly softened its earlier demands, it still wants 40 per cent of every car built in a high-wage jurisdiction; 75 per cent of all parts to be North American; and 70 per cent of steel to be North American. Critics of the plan say it could backfire. Automakers could decide they don't want to deal with all the red tape and simply ignore NAFTA and pay the 2.5 per cent U.S. tariff on imported cars. Critics say that won't create jobs — just more expensive cars, and less economic activity. One other major sticking point is the U.S. proposal of a sunset clause. The U.S. has pushed for a clause in the deal that would cancel NAFTA after five years, unless every country agrees to keep it. Critics say this is a recipe for permanent uncertainty. They ask how a car company, for instance, is supposed to invest in all the assembly-line changes demanded in this deal, when the whole deal could be over in five years. Critics also point out that NAFTA already has a termination clause, which countries can invoke if they're unhappy. Prime Minister Justin Trudeau ridiculed the sunset idea in a public event in New York. He used a real-estate metaphor and made clear he was addressing President Donald Trump: What developer would build a skyscraper on a piece of land, Trudeau asked, if access to that land was only guaranteed for five years?